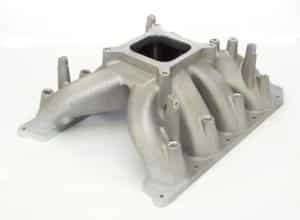 The intake manifold is a vital engine component without which a car cannot function properly. It is responsible for the accurate dissemination of air into the engine cylinders for combustion. Therefore, combustion inside the engine is impossible without an intake manifold. Furthermore, if the intake manifold fails, your car’s vital functions deteriorate and you experience a decrease in a car’s performance. Inside the intake manifold are gaskets that seal air away from coolant that passes through nearby. If the gaskets inside the intake manifold wear out, you will be able to sense a few symptoms. Looking out for these symptoms can help you save a lot of money in the long run. The most common problem with the intake manifold is a blown gasket. Since gaskets are made of steel and rubber and they are relatively thin, they are prone to break very easily. Gaskets come under real pressure when the engine runs and over time they can deteriorate to an extent that the car starts to feel the effect. Usually, a gasket needs to be changed in 50,000 to 70,000 miles if everything else works well. When it fails, you will see a number of signs. Some newer cars do have swirl flaps inside the intake manifold which can fail. In this case, you do often have to replace the whole intake with a new one! The intake manifold’s gasket seals away air from mixing with the coolant chamber. When the gasket fails, the coolant starts to leak and the first effect is felt by the engine which starts to overheat due to loss of coolant. You will see this while driving with a rising temperature gauge in your dashboard. It is advisable to visit the mechanic as soon as this happens because an overheated engine can seize and stop working completely. In emergency situations, refilling the coolant can allow your car to run for an extra few miles. Learn more about overheating here: Overheating car engine. As soon as the intake manifold fails, the fuel and air ratio will be affected. We all know how vital the air to fuel mixture is for efficient combustion, so any effect on it can affect your car’s fuel economy. You will find yourself burning up more fuel and filling the fuel tank more frequently. Not only that, but you will feel your car is not accelerating properly and that the engine is experiencing hiccups. Whenever this happens to visit your local mechanic to get your car checked out. When the intake manifold fails the coolant starts leaking from it. To inspect the leak you will have to look below the car or around the intake manifold. Any leaking of the coolant will unnecessarily destroy your car’s performance. The intake manifold can be seen visually but all issues related to the manifold are inside and so you cannot repair or clean anything without opening up half of the engine. However, for the sake of all the petrol heads reading this, we will tell you the best way to clean the intake manifold and its gasket. The intake manifold is the bunch of pipes joining the engine usually on the top. It is hard to miss but it is also often very hard to disassemble, therefore, it is better if you let the mechanic do this part. However, if you are proficient and qualified enough to open up the intake manifold, go for it! Once you have opened up the manifold, first take out the gasket and check if there is a crack somewhere on it. If there is, you are looking at a blown gasket and it is easily replaced. But it cannot be repaired, so you have to change it. Also check for any signs of cracks in the intake manifold from which it could take air from. If your intake has swirl flaps inside, check the swirl flap inside the manifold and if they’re broken, you have to replace the whole manifold. To clean the intake manifold and the gasket, first, you need to wash them off with water. Once you have washed off the intake manifold and its parts with water, let them dry. As soon as the parts have dried, apply grease to all the joints and reassemble the intake manifold. Always make sure, you don’t let dirt or any other contaminants near the intake manifold. Use a blower if needed. Finally, reassemble everything and place the intake manifold back where it belongs. All this is easier said than done, so keep extreme care when handling heavy engine components. Chances are that you are part of the majority and disassembling the intake manifold is not your cup of tea. In which case, you will require a mechanic to help you out. Mechanics have the proper tools as well as the proper motivation to repair a bad intake manifold. However, keep in mind, disassembling an engine requires lots of hard work, so you should expect exorbitant labor costs. Generally speaking, the labor costs should lie around the $150- $300 bracket, but that depends on the make and model of your car. As we have mentioned above, the most common issue with a failing intake manifold is its broken gasket. These steel and rubber plates are not repairable, so you have to replace them with new ones. Fortunately, gaskets are not very expensive and one should cost you around $80 – $120. Once your mechanic has been successful in disassembling the intake manifold and reassembling it, it is time for you to check out the performance of your vehicle. It is entirely possible that your mechanic makes the repair and the problem still exists, that’s why driving and checking the car is necessary before handing him the money. Firstly, add fresh coolant to your radiator until the radiator fills to the brim. Secondly, start your car and let it heat up. If the temperature gauge remains stable for a good 10-15 minutes, try driving off and accelerating. If the temperature gauge rises, the problem still persists, which means the mechanic has to repeat the painstaking process. Otherwise, it is possible there is another blown gasket in the system which needs replacement.